•	Beautiful Newsstand UI: Beautiful and intuitive newsstand UI makes it easy for you to select news channels. 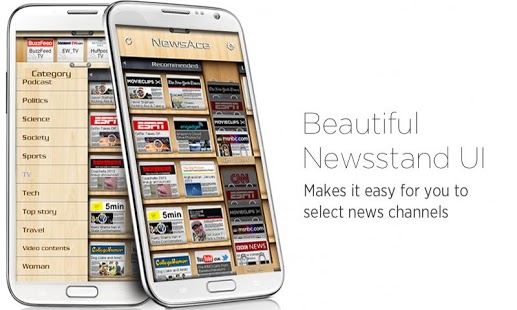 •	One stop news reader: You can check all types of news feeds in one place, NewsAce. 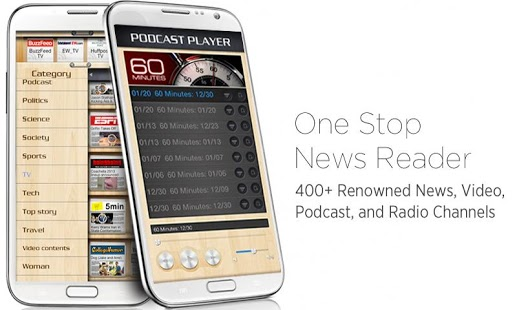 •	News feed recommendation: 400+ renowned News channels are categorized and provided in the recommended section. 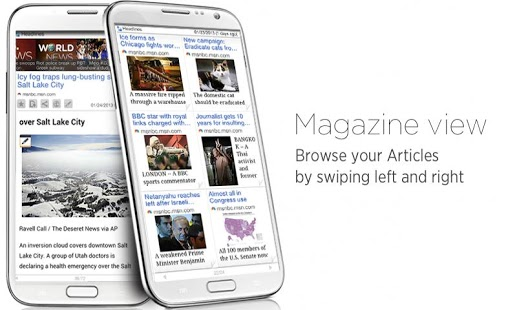 •	Gestures based Navigation: By swiping left or right, you can easily switch from NewsAce’s recommended news to your Google Reader selections and vice versa. • (Samsung Galaxy Note II feature) By hovering on news thumbnail, you can see auto scrolled news preview. 400+ recommended news channels including CNN, Movieclips (movie trailers), The New York Times, ESPN, Engadget, Boingboing, The Big Picture, 5min, Best Radio Podcast, College Humor, YouTube and Twitter.